Goals by Gus Conrad (2), Matt Galgano and Hayden Thayer boosted the Wood River Warriors to a 4-3 Treasure Valley Lacrosse League Division 2 win over Boise’s Borah Lions Saturday at Founders Field in Hailey. Strong defense and the 11-save effort of Miles Jones resulted in Wood River’s fifth straight win in a match-up of the top two teams in the seven-team TVLL Div. 2. 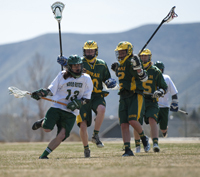 Borah had beaten the Warriors 5-3 at Mountain Home April 2. Wood River (6-1-0) stretched its goals-against to 51-30 and pulled ahead of Borah (4-1-0) and Meridian (4-2-0) atop the division. The Warriors clash for the first time with Ambrose of Meridian (3-3-0) today, Wednesday at 6 p.m. on the Mountain Home pitch. Next and final home game is Saturday, May 3. Playing before an enthusiastic home crowd Saturday (particularly the student section), the Warriors kept it interesting committing numerous turnovers on ill-advised passes across the defense in the first half. Taking 42 shots the Warriors were not lacking opportunities, but they struggled to get the ball on goal. Fortunately aggressive rides in transition regained possession to keep the ball in the offensive end. Conrad scored first for the Warriors, then Borah tied it, next Galgano scored, and Borah tied it again. Trailing 3-2 in the fourth quarter Thayer ripped one from the outside to tie the game 3-3. Shortly after that Conrad faked left, went right and buried the game winner with his off-hand. Borah had a chance to tie with minutes remaining. But Travis and Zach Swanson, Hayes Gilman, Cooper Bailey, Thayer and Conrad put on a clinic of lock down man-to-man defense that secured the big win. The Warriors were good on ground balls winning 47 with Asher Loomis scooping five in the defensive end, and Thayer and Conrad each with seven. Wood River was 7-of-11 on clears with Sage Kelly doing a great job running the field and controlling the clears. The Warriors won six of 10 faceoffs. They showed good hustle from the wings by a multitude of midfielders. Matthew Fisher had the only assist. Leading season scorers are Bailey (17 goals/2 assists), Thayer (8/2), Conrad (8/1), Evan Telford (5/1), Galgano (3/4) and Fisher (2/3). Goalie Jones has made 87 saves in his seven games. Wood River entered Saturday’s game coming off its most dominant effort of the season with its 14-2 win over Skyview (0-6-0) last Wednesday in Mountain Home. Winning the ground ball battle was critical to the big win, as the Warriors captured 13 of the 18 faceoffs and finished with 45 shots. New players showing promise included Boadie Bennett (2 goals), Nate Jones (excelling at faceoffs) and Kevin Browder (midfield play). Bailey (4 goals/1 assist) led all scorers. Others were Conrad (2/0), Telford (2/1), Fisher (1/2), Galgano (1/0) and Keegan Heneghan (1/0). Defensively, Zach and Travis Swanson shot down the cutters, caused turnovers and cleared the ball efficiently. Asher Loomis added three ground balls on defense.